The World’s Best Day Trading Chair? Best Day Trader Chair In The World. Downloadable FREE PDF Version. An all too often overlooked piece in the puzzle for trading excellence is in the posture of the Super Trader; how one sits whilst trading. The perfect seating solution aims to attain perfect harmony between mind & body, creating a natural synergy between Trader & computer. To claim that the ‘Herman Miller Embody’ chair is the ‘World’s Best Day Trading Chair’ is a subjective affair, & thus this bold claim is but just one’s opinion (mine); but certainly this is a chair definitely worth considering if you are planning long hours in front of your monitors Day Trading for a living. 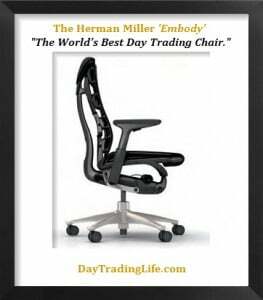 I personally have taken delivery of an ‘Embody’ here in the UK (Delivered 24/03/2011) & I must say that perhaps unwittingly, Herman Miller have created a truly Professional Day Trading Chair that really does tick all the right boxes; (although with a £1,000+, price tag, this is a chair that needs to be looked at from a Trading perspective; humm, the word ‘Investment’ springs to mind! On a serious note; if you are spending nearly a third of your life (up to 8hrs a day) sat in front of your PC or desk within the realms of Trading for your living, then spending what seems initially is a hell of a lot of money for a chair, actually equates to really good value & a sound investment over the longer term. So, let me here present my synopsis of the ‘Herman Millar Embody,’ & touch upon some of the chair’s many attributes. Pixelated Support™ technology (In the seat & back) that helps keep the blood circulating. Backfit™ adjustment (adapts to the unique curvature of your spine). Adjustable seat height & seat depth, tilt tension & arm adjustment (Up/Down, In /Out). Breathable, translucent & resilient seating & covering skin. 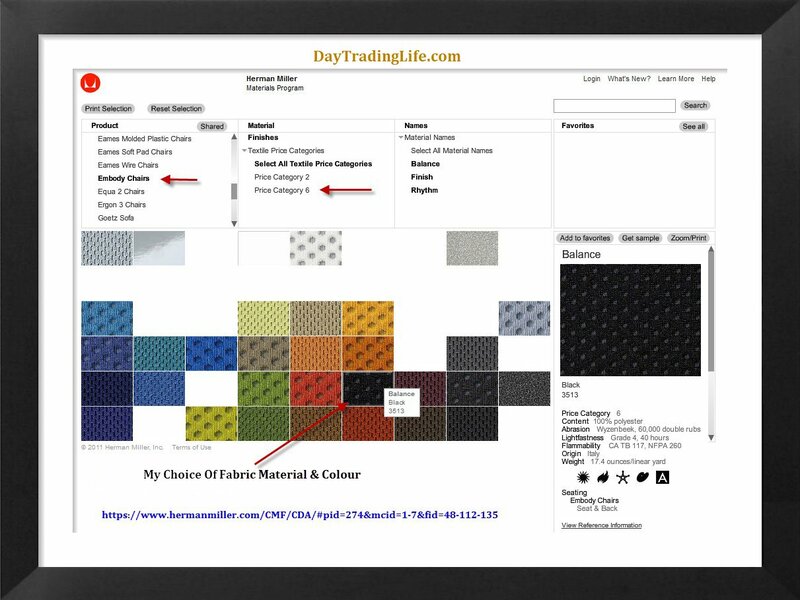 Optional fabric materials & colours; frame base & caster options. Environmentally friendly (Greenguard (Air Quality) & MBDC Silver (Chemically) certified). Officially the World’s 1st health positive chair. Herman Miller – Embody PDF & VIDEO Files. HM – Embody Chair Adjustments. HM – Environmental Summary Sheet. HM – Chair Care Brochure. HM – Textile Quality Standards. HM – Thermal Comfort Research. HM – Embody Tilt Research Paper. HM – Improving Oxygen Flow Paper. HM – Lowering Heart Rate Research. HM – Pressure Distribution Paper. The Herman Miller Embody is clearly innovative in style & design, a chair created without compromise aesthetically & functionally; possibly the ultimate Ergonomic Trading Chair? 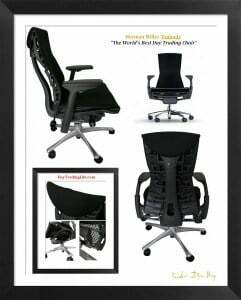 It is fundamentally a task chair that has practically adjustable everything so you get 100% comfort no matter what size of frame & build you are. The Embody’s development team included input from 30 professionals with diversified fields ranging from bio-mechanics to physical therapists & vision experts. This chair was designed at the outset to be the best in its class & actually redefine the way people sit. The Embody’s back has an ‘alive’ ‘Kinematic Spine’ that mimics your spine, adapting to the natural shape & movement of your spine, constantly adjusting itself to your shifting positions & postures. This not only supports your body (with an almost floating sensation), but supports your mind as well. This Pixelated Support™ system, a matrix of pixels that work together in the seat & backrest conform to the sitter’s movement. Technically, this creates a ‘Health Positive Chair’ due to its ‘dynamic’ surface pressure distribution. (Dynamic surface pressure on a chair & back will provide more comfort, liveliness, & health-positive benefits than non-dynamic surface pressure. At least that what it says on the Herman Miller website)! With its backfit™ adjustment you can also gain a neutral balanced posture regardless of your spine curvature. What I did find interesting being a Day Trader is the benefits of a slight reduction in heart rate sitting in the Embody chair rather than a conventional chair. All Day Traders are well aware that Trading is predominantly a mind game, a profession that requires one to constantly perform & control one’s emotions. Heart rate plays a very important part in mind, body & emotional stability; coherence. Anything that gives a Trader’s Edge needs to be looked at very closely. In one of the above PDF research papers named ‘HM-Lower-Heart-Rate’; a commissioned study was carried out that measured 6 cardiopulmonary variables. (To cut a long story short), here are 2 quotes from that paper. So; a ‘Health Positive Chair’ that by design Reduces Heart Rate & ‘Increases Blood Flow’ (Sited to allow more oxygen to flow to the brain) etc. Sad to say, but this chair is getting interesting! Another point I would like to mention that is trading specific. Often whilst trading, I need to shift my frame of reference, re-evaluate my positions as they move in real time. Sometimes I need to induce a ‘NLP’ technique; where one visually (within the mind’s eye) remove themselves from their current posture & look at themselves from a detached perspective, so as to review & analyse their current trading position (emotionally & physically) within a new conjecture. The Embody’s reclining mechanism is really like no other. It’s actually quite hard to describe the sensation it gives you whilst you gently recline back, but it really does enhance your thought processes whilst in a reflective mode, or simulating a detached perspective. This alone is a huge benefit for Professional Traders & one I haven’t experienced with the same intensity in any other chair. From an environmentalist point of view this chair is landfill friendly! Construction of the Embody has been accomplished with 40 percent recycled materials. Another big plus is that 98 percent of this chair is recyclable at the end of its life. What with the Embody having a 12 year warranty to boot, & GreenGard Certification relating to safer air quality & MBDC Certification; meaning all the components of the Embody have been chemically tested so that they are safe for the environment; then this is a chair that even ‘Green Peace’ would clearly love! Enough info regarding the chairs attributes. From the above I think any Day Trading Professional can deduce that this is a chair worth considering. But what’s the best way to purchase one? Well, firstly let me state that I am a big advocate of internet shopping. I love Amazon & price comparison sites, but with this type of purchase things really do need to be different. Firstly, I wasn’t sure if it was the Embody or the Aeron (Another Herman Miller Classic Ergonomic chair) that I wanted. So, I looked for a local authorized distributor. The proprietor of Burnham’s Workplace Ltd is James Burnham. I believe this has been a family run business for more than 30 years & my first conversation with James instilled me with confidence. What I mean by this is that I asked a number of probing questions (having exercised due-diligence) regarding the Herman Miller Embody & Aeron chairs that I was looking to possibly purchase. James answered all of my questions in a very knowledgeable way. This wasn’t some typical sales person I was in conversation with but a proprietor of a very well respected office design & supply company that really knew his products & genuinely cared about the products he sold! I like this style; this ethic. If I was to part with more than £1,000 on a chair, I wanted 100 percent confidence in my chosen supplier. I did actually visit Burnham’s & try both chairs out initially. To be honest, something just held me back from making my decision to buy there & then. I really needed to try the Embody ‘In situ’ sat at my trading desk. I asked James if this would be possible. Now here’s another reason why I purchased through Burnhams. James made me feel that my request was perfectly valid & arranged to deliver both chairs (Embody & Aeron) to my home to try at my convenience. A large chain in the UK called ‘John Lewis’ also stock the Herman Miller range. Question: Would I have gotten the same product knowledge from one of JL’s sales staff? Would both chairs have been delivered on a ‘try before you possibly buy ‘request? I think you know these answers. Here’s the best bit. Sitting in the chairs at Burnham’s Showroom, I just wasn’t convinced which one to even go for! But; with the chairs now at my Trading Desk, it was now all so clear. The Embody was just so perfect in all departments. I mean really! 6 years of sitting in a Staples £50 Chair & now this! Literally there was only one thing to do; arrange my deposit! Well; actually two things to do; choose my fabric type & colour, along with aesthetic finishing materials. The Herman Miller Embody is a chair for all serious traders. “Sometimes In Life You Really Do Get What You Pay For. Only 2 points to mention here. Whichever way you cut it, £1,000+ on a chair seems (is) a lot of money. 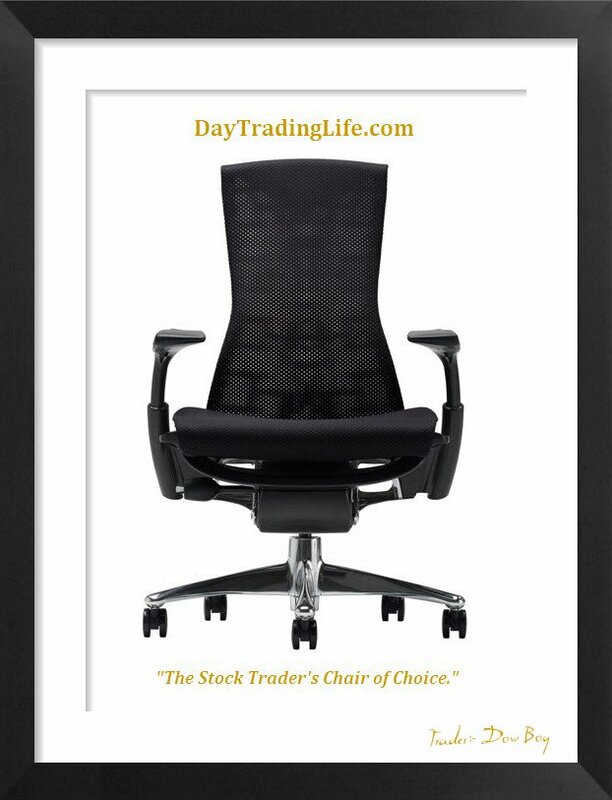 If you are serious about your day trading (which you should be as it is a business), & you can understand from my above comments that this really isn’t any ordinary chair, but one of those ‘trader’s edges’ that you often hear about. Trust me on this; your money will be well spent. A chair that is scientifically proven to reduce your heart rate & help you function optimally in a health positive way cannot be underestimated. (So actually; it’s not really a negative after all)! This isn’t a fault or undesirable comment regarding my chosen supplier (Burnhams), as they delivered the same day the chair actually came into their possession. The lead time in the UK for the Embody at my time of purchase was 6 bloody weeks! Now, come on Herman Miller! I understand this is actually made in the USA. But; a premium product such as this, with its price tag to boot! You really would have thought its UK arm would have several of these in stock, ready to ship to their UK authorized dealers. I hope Herman Miller address this issue. It really is the only thing that lets this be a 100 percent thumbs up. Maybe in time or soon after writing this review things here in the UK might be different. I’m sure in the USA their lead times would be just days! UK Buyers; Check Lead Times With Your Authorized Dealer Before Purchase! I titled this review, “The World’s Best Day Trading Chair” & to be honest, this quite possibly is. 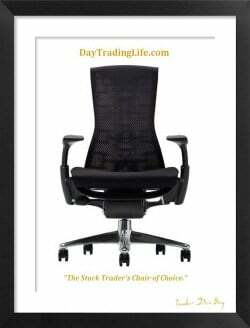 This is a chair only for the Serious Day Trader; one that is constantly seeking an edge in any shape or form it comes. I highly recommend the Herman Miller Embody as a Trading Chair without compromise. Anybody here in the UK wishing to purchase a Herman Miller Embody can do no wrong by contacting James Burnham first on 01202 73 80 73. I highly recommend his ‘Old School’ level of customer service & thank him for making my purchase a very pleasurable experience. So there you have it. DowBoys Day Trading Chair, email, surfing & shopping chair is now a Herman Miller Embody! When something comes along that on some level can aid you into attaining this ‘Zone’ like state, take note! A Super Trader seeks ‘Edges’ from all facets of life; be it health, emotional, relationships etc, not just trading per-say. The Zone can only exist in a state of pure PEACE. Edges help to create this peaceful place where only ‘Super Traders’ live with consistency. The Herman Miller ‘Embody’ IS (at some level) a trader’s edge. Good luck with your trading Santo. Remember; ultimately, PEACE is what we all seek. In life and in Trading.